“Zeal for the salvation of souls is of so great a merit before God, that to give up all our goods to the poor, or to spend our whole life in the exercises of all sorts of austerities cannot equal the merit of it. There is no service more agreeable to God than this one. To employ one’s life in this blessed labor is more pleasing to the Divine Majesty than to suffer martyrdom. Let us, at once, grasp that the terrible war which is raging universally is a battle against the Holy Ghost! The Immaculate is so closely united with the Holy Ghost that she is called His spouse. She is, so to speak, the personification of the Holy Ghost! It is impossible to separate the Holy Ghost from Mary the Immaculate, since she is the instrument He uses in all He does in the order of grace. Clearly, then, this raging battle is most surely a war against the Immaculate Mother of God! It is a full attack on Truth, Unity, and Love Itself! Arrogant and well-disciplined by an inhuman mystique, the enemy applies methodically, point-by-¬point, his plan of extermination. The greatest crime of this enemy is that it succeeds in the perversion of the very virtues of Christianity. Only Saints can resist this poison. How often do we not return hate for hate towards these ruthless criminals and butchers! We even justify our hatred towards them. When slapped on the right cheek, instead of turning the left, we return the slap with a resounding blow. Even if we gained a temporal victory, the enemy has succeeded in infecting us with his deadly virus. To live in an atmosphere of hatred and not be contaminated by that hate is as miraculous as raising the dead to life. Try to realize that, in Mary, there is a magnificent palace built of gold and precious stones, worthy of the great King Who dwells there; and try to realize what is true: that you are contributing toward His splendor and glory by honoring His permanent dwelling place, which is the Immaculate Heart of Mary! Through obedience, Mary was espoused by the Holy Ghost. By Mary’s Immaculate Conception, an implacable enmity arose between her and the ancient adversary, the devil; thus, she was able to intimately join in her Son’s mortal struggle against Satan, sin and death. Mary shares completely in both the victory of Jesus Christ and in the royal power won by right of conquest. From Christ, then, and through her, all grace comes to us. Delegate of the Infinite Mercy, she is the crucible in which all our dross is consumed by the flame of sacrificial love, and made into a worthy offering of purest gold. As Mother of Christ the Head, she is therefore Mother of the Mystical Body. Spouse of the Holy Ghost, she receives only to give, and takes only to transform. There is only one obstacle insuperably destructive of her redemptory action – ¬our voluntary refusal of it. All that matters is to surrender to her sanctifying action and to be a ready instrument in her radiant hands. She is the Immaculate, the direct way to Christ, the weapon of conquest with which to establish the reign of Jesus Christ universally from one end of the earth to the other! Nothing must sorrow the Holy Ghost quite as much as the mediocrity of souls avowed to the Blessed Mother. Let us sacrifice our lives a thousand times to sanctify them. There is not one single heroic act that we cannot accomplish with the help of the Immaculate! We live in a time of great penance. Let us, at least, know how to profit by it. Suffering is good and sweet to him who accepts it willingly. How eternally efficacious for the salvation of souls is this surrender of our wills to the Will of God! The evil is very great and time grows short! Why have we not known how to save IN TIME the golden grain of truth stolen by the “Father of Lies”! It is all so simple. 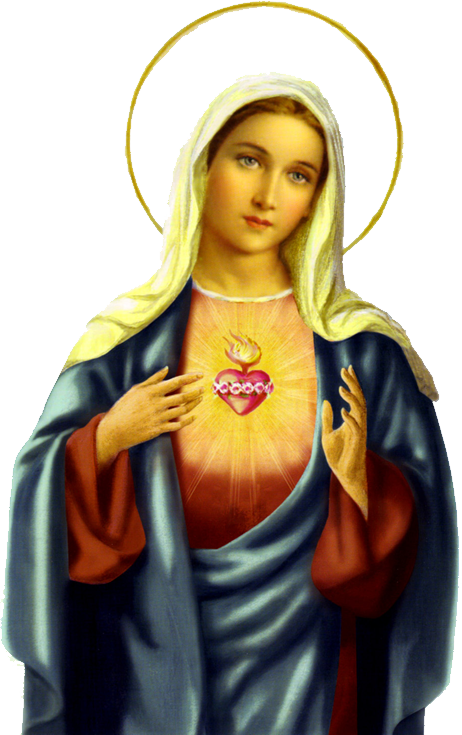 We must belong entirely to the Immaculate Heart of Mary, absolutely and unconditionally. Our sanctification is her mission. Let us conquer for Christ all souls in the entire world to the end of time … through the Immaculate Heart of Mary. LOVE FOR THE MOTHER OF GOD! LITANY TO THE IMMACULATE HEART OF MARYLord, have mercy. Heart of Mary, Created in the image of God, pray for us! Heart of Mary, Mother of the Word made flesh, pray for us! Heart of Mary, Worthy dwelling of the Holy Ghost, pray for us! Heart of Mary, Pinnacle of human love, pray for us! Heart of Mary, Whose love is stronger than death, pray for us! Heart of Mary, Saddened at the wounds of Christ, pray for us! Heart of Mary, Pierced by the sword of sorrows, pray for us! Heart of Mary, Sacrificed at the Altar of the Cross, pray for us! Heart of Mary, Fruit of the Heart of Jesus, pray for us! Heart of Mary, Joy of the Heart of Jesus, pray for us! Heart of Mary, In which God is well pleased, pray for us! Heart of Mary, Inward glory of divine grace, pray for us! Heart of Mary, Golden temple of holiness, pray for us! Heart of Mary, Treasure throne of God’s riches, pray for us! Heart of Mary, Mediatrix of all graces, pray for us! Heart of Mary, Refuge of sinners, pray for us! Heart of Mary, Strength of those who mourn, pray for us! Heart of Mary, Comfort of the forsaken, pray for us! Heart of Mary, Home of the desolate, pray for us! Heart of Mary, Helper of the troubled, pray for us! Heart of Mary, Consolation of the distressed, pray for us! Heart of Mary, Sanctuary of the persecuted, pray for us! Heart of Mary, Hope of the dying, pray for us! Heart of Mary, Shield of the Church, pray for us! Heart of Mary, through which evil is overcome, pray for us! Heart of Mary, through which Nations find peace, pray for us! Heart of Mary, through which families are blessed, pray for us! Heart of Mary, through which Christians rejoice, pray for us! Heart of Mary, through which heresy is vanquished, pray for us! Heart of Mary, save us from sin! Heart of Mary, save us from evil! Heart of Mary, save us from damnation! Heart of Mary, Queen of Heaven! Heart of Mary, Queen of Peace! Heart of Mary, Queen of Justice! Heart of Mary, Queen of the human family! Heart of Mary, Mother of God! Heart of Mary, Mother of the Church! Heart of Mary, Mother most kind! Heart of Mary, our sweetness and joy! Heart of Mary, our hope and consolation! Heart of Mary, our refuge and protection! Heart of Mary, be ever blessed! Heart of Mary, be ever joyful! Heart of Mary, be ever acclaimed! Lamb of God Who takest away the sins of the world, Spare us, O Lord. Lamb of God Who takest away the sins of the world, Graciously hear us, O Lord. Father of Divine Love and Mercy, grant that by venerating the Immaculate Heart of the Blessed Virgin Mary, we may be drawn closer to the Sacred Heart of Thy beloved Son Who liveth and reigneth for ever and ever. Amen. My God, I believe, I adore, I hope and I love Thee. I beg pardon for those who do not believe, do not adore, do not hope and do not love Thee. Most Holy Trinity: Father, Son and Holy Ghost, I adore Thee profoundly and I offer Thee the most Precious Body, Blood, Soul and Divinity of Jesus Christ, present in all the Tabernacles of the world, in reparation for all the outrages, sacrileges and indifference by which He Himself is offended. By the infinite merits of His most Sacred Heart and the Immaculate Heart of Mary, I beg of Thee the conversion of poor sinners. This entry was posted on Wednesday, August 29th, 2012 at 3:23 am and is filed under NewsFlash, Saint Philomena. You can follow any responses to this entry through the RSS 2.0 feed. Both comments and pings are currently closed.